Guest post by Alexandra Hall: Columbia University's Cabot prizes provided a one-sided view of the state of press freedom and media democracy in Latin America. Guest post by Alexandra Hall. Last week, the Columbia University Graduate School of Journalism in New York City awarded five Latin American journalists its prestigious annual Maria Moors Cabot prize that recognizes media professionals who contribute to inter-American understanding. That same week, the University’s Graduate School of Journalism hosted a panel where the award’s recipients, journalists from Venezuela, Ecuador, Colombia, and the United States, gave their analyses of the recent results of the 2012 Venezuelan elections and what they identify as a regional threat to the freedom of expression. The political context of the transnational Latin American journalists' arrival and discussion of their experiences in reporting on elections involves a regional trend wherein the governments of certain countries, including Argentina, Ecuador, Uruguay, Bolivia, and Venezuela, to name a few, have moved to enact legislation to democratize an increasingly commercialized and consolidated media spectrum. Moderator Carlos Lauría, Senior Americas Program Coordinator of the Committee to Protect Journalists, gave each journalist the opportunity to elaborate on specific situational contentions they experience as journalists in their respective countries. Juan Forero, Bogotá-based Latin America correspondent for NPR and The Washington Post, concentrates on Colombia and Venezuela. I was shocked to hear his lecture, which was a reiteration of the academic meta-narrative that Venezuela’s failing institutions place it within the category of semi-democratic Latin American countries drifting towards authoritarianism. Before attending the event, I wasn’t well versed in Forero’s Andean coverage. I had assumed that an NPR correspondent would utilize a more politically nuanced awareness in his analysis, but after hearing Forero’s comments, I did some research and realized that others had also picked upon the consistent lack of depth in his reporting. As a graduate student of Latin American politics and international relations, I am no stranger to the thesis of Forero’s argument and do not doubt its viability as an academic theory. But I was under the impression that Forero had been invited to the J-School as a journalist, not a political scientist. He recycled superficial criticisms from Human Rights Watch reports on under-researched events like Venezuela's “shutting down” of Radio Caracas Television (RCTV), a station involved in a U.S.-backed 2002 coup against Chávez. (In point of fact, the country's telecommunications commission declined to renew RCTV's license.) The overwhelming acquiescence to Forero’s expert opinion was disheartening but not unfamiliar. The Latin American Bureau Chief to The Wall Street Journal, David Lunhow, talked about how Chávez’s control of state resources to fund his presidential campaign effectively crushed the opposition's ability to communicate its messages via media, because private media is unable to match the financial resources of the Venezuelan government. Lunhow explained that the saturation of Venezuelan media with official propaganda and the interruptions of cadenas—broadcasts of the President's speeches mandated on all channels—delegitimizes Venezuela’s most recent election results. "Es una elección, pero no es nada democrática," said Lunhow (It's an election, but it's hardly democratic). He provided a personal anecdote of a trip to Caracas, where, while watching Capriles deliver a speech on Globovisión, Chávez quickly interrupted the broadcast with his own transmission, thus exposing Venezuelans only to the president’s campaign and censoring that of the contender. Teodoro Petkoff, a former communist guerrilla, politician, and the founder of Tal Cual newspaper was the most prominent panelist. Petkoff’s responses to questions regarding freedom of expression in Venezuela were a confirmation of my own fieldwork research on Venezuelan press freedom. According to Petkoff, there is freedom of expression in Venezuela: "es acosada, pero hay libertad" (It is harassed, but it exists). He said that the existence of consistently critical media like Globovisión is a testament to this. One of the most crucial points to consider is that the relationship between the executive branch and media companies has historically been much worse under prior administrations, especially during the Fourth Republic, the period of political power sharing that prevailed before Chávez's 1998 election. A February 2001 Committee to Protect Journalists report on Venezuela quoted Petkoff’s assessment of the media situation under Chavez’s administration: “So far, we haven’t experienced the attacks on press freedom that we’re accustomed to here in Venezuela.” He also pointed to the debilitating lack of communication between both sides of the polarized media/politics debate, probably the most problematic aspect of the reality of Venezuelan media democracy, which doesn’t mandate one side’s attack of the other. Surprisingly, the report that Voice of America, or Voz de América (the U.S. government’s international broadcast to rogue Latin American states) aired on the awards included important contextual details that panelists excluded from their own comments. Two journalists from El Universo accepting a special citation for their continued reporting in the face of controversial libel lawsuits used the panel as an opportunity to speak about dangerously vague wording in Ecuador's new Elections Law, which prohibits reporters from broadcasting or printing interviews and other content that aims to shape public opinion in favor or against any one political candidate. 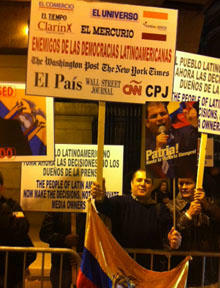 The same night that awardees were honored, protestors (many of them Ecuadorians living in the United States) were demonstrating outside of Columbia’s School for Public and International Affairs, carrying signs and shouting slogans that Ecuadorian newspaper El Universo doesn’t deserve an award because of its dishonest and unethical reporting. I won’t turn a blind eye to these journalists’ testimony, which in no way is invalid. It is one side of a plurality of experiences and reactions to the recent changes to Latin American media democracy that includes the inaction of media reform legislation to break down media monopolies in order to create a more accessible educational and politically conscious (non-sensationalist) media (see “A Panorama of Media Democratization,” NACLA Fall 2012). The emergence of laws like these are part of a broader, yet highly relevant political context that involves long-standing political conflicts between leftist administrations that attempt to reform media, and large media conglomerates like Argentina’s El Grupo Clarín and Venezuela’s Grupo Phelps that reject a reconfiguration of what media looks like in the western hemisphere. What's most striking is that a panel organized for journalists accepting an award became a microphone for dissenting political analysts and freedom of expression activists. It’s interesting, and should raise speculation that not all journalists share the same opinion with regards to these changes. For community journalists and those who are familiar with Latin American commercial media’s manipulation of information to discredit the policies of current administrations, these changes are an improvement in media democracy. This isn’t to say that the experiences of the recipients of this year’s wards are invalid, but they do represent just one interpretation of what Inter-American media democracy entails. The Americas are not politically homogenous, and the feting of commercial media professionals involved in a political conflict with leftist governments in Latin America provides only one side of the issue of the state of press freedom and media democracy in the region. Alexandra Hall is a master's candidate at Columbia University's Institute of Latin American Studies. She currently researches press freedom and media democratization in Venezuela and is a regular contributor to NACLA Radio.